UPPER MANHATTAN — After hearing numerous complaints from residents about the NYPD's controversial stop-and-frisk policy, Community Board 12 voted to support a citywide resolution calling for the reevaluation and reform of the procedure. CB12’s public safety committee voted on the resolution after a public hearing Wednesday on the presence and impact of such policies in Upper Manhattan and changes they would like to see. At the meeting, residents of color said they are victims of a disproportionate number of stop-and-frisk checks. "We should hold our police to a higher standard," board member Harlan Pruden said, calling the practice "lazy" police work. 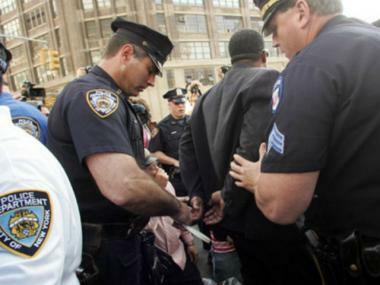 Of the NYPD's 700,000 stop-and-frisk incidents last year, 6,000 of them were conducted in Washington Heights and Inwood during the first half of the year, according to the Manhattan Borough President’s Office. Those 700,000 stop-and-frisks in 2011 led to 42,000 arrests and another 42,000 summonses, civil rights attorney Leo Glickman said at the hearing, citing NYPD data. "That means, according to NYPD statistics, 616,000 of those people were wrongly suspected of a crime," he said. "Do you believe in your heart of hearts that in the great majority of those cases, the police believed the young man committed a crime, and in good faith got it wrong?" The committee resolution called for an examination of the procedure. It was based on a similar resolution Manhattan Borough President Scott Stringer presented in September 2011 that called on the NYPD to "take steps to reform stop and frisk immediately." That resolution called for a federal investigation into how the practice is used in New York to determine whether racial profiling remained a problem and whether increased accountability for precinct commanders, enhanced training and the adoption of new techniques could limit incidents of unfair targeting. "We are very concerned about the data that we have concerning the adverse impact that the NYPD 'Stop, Question and Frisk' policy is having on members of the Washington Heights-Inwood Community,” Pamela Palanque-North, chair of CB12, wrote in an email about the resolution. The resolution will come to a vote in front of the full board on March 27. Palanque-North said the board was responding to concerns raised by residents in the area who claim there is "overwhelming evidence that specific ethnic and racial groups have been 'Stopped and Frisked' in disproportionate numbers" across New York City and in the Uptown district. Although representatives from the local 33rd and 34th precincts were invited, they did not attend the three-hour hearing. Officials from the Manhattan District Attorney's office also did not attend. Not everyone who attended Wednesday’s meeting agreed with the proposal to change the stop-and-frisk policy. Community member and former 2009 City Council candidate Ruben Dario Vargas argued that most police use the tactic in a fair way and are trained to spot suspicious behavior more readily than an untrained civilian. He claimed that removing the practice puts cops' lives at risk. "Police need it," he said. Several members of the board agreed with Vargas, emphasizing the need to change the procedure but stopping short of calling for its end. "I recognize that there is some concern that this would take away a tool from the NYPD to prevent crime," CB12 member Angelo Ortiz said. "I don’t believe that's the intent here. I don’t believe it's intended to take a tool, but to make it better."